[S12] C. Arnold McNaughton, The Book of Kings: A Royal Genealogy, in 3 volumes (London, U.K.: Garnstone Press, 1973), volume 1, page 442. Hereinafter cited as The Book of Kings. [S213] Unknown author, "unknown article title," European Royal History Journal: issue XLV, page 18. [S2757] Frank O'Donnell, "re: Borbone Family," e-mail message to Darryl Roger Lundy, 3 April 2008. Hereinafter cited as "re: Borbone Family." Catherine Elisabeth Alberique Marie Bonaparte, Princesse Napoléon was born on 19 October 1950. She is the daughter of Louis Napoleon Bonaparte, Prince Napoléon and Alix de Foresta, Comtesse de Foresta.1 She married, firstly, Nicolo San Martino d'Aglie, Marchese di San Germano on 4 June 1974 at Pragins, SwitzerlandG. She and Nicolo San Martino d'Aglie, Marchese di San Germano were divorced in 1982.1 She married Jean-Claude Dualé on 22 October 1982 at Paris, FranceG. She gained the title of Princesse Catherine Napoléon. From 4 June 1974, her married name became d'Aglie. Her married name became Dualé. Jean-Claude Dualé was born on 3 November 1936 at Medjez-el-Bab, TunisiaG. He married Catherine Elisabeth Alberique Marie Bonaparte, Princesse Napoléon, daughter of Louis Napoleon Bonaparte, Prince Napoléon and Alix de Foresta, Comtesse de Foresta, on 22 October 1982 at Paris, FranceG. Laure Clementine Genevieve Bonaparte, Princesse Napoléon was born in 1957.1 She was also reported to have been born on 8 October 1952 at Paris, FranceG. She is the daughter of Louis Napoleon Bonaparte, Prince Napoléon and Alix de Foresta, Comtesse de Foresta.1 She married Jean-Claude Lecomte on 23 December 1982. She gained the title of Princesse Laure Napoléon. Her married name became Lecomte. Jean-Claude Lecomte was born on 15 March 1948 at Ax-les-Thermes, FranceG. He married Laure Clementine Genevieve Bonaparte, Princesse Napoléon, daughter of Louis Napoleon Bonaparte, Prince Napoléon and Alix de Foresta, Comtesse de Foresta, on 23 December 1982. He gained the title of Prince Jerome Napoléon. Napoleon II Bonaparte, Duc de Reichstadt was born on 20 March 1811 at Tuileries, Paris, FranceG. 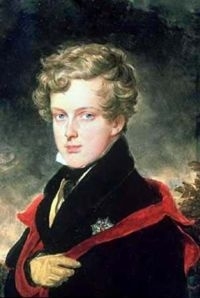 He was the son of Napoleón I Bonaparte, Empereur des Français and Marie Louise Erzherzogin von Österreich.1 He died on 22 July 1832 at age 21.